So you finish off your Canuck’s, and then what do you move onto next? What’s that? Aussies? Well of course, that’s the better choice, or even Japanese or Indian. Heck, some US single malts are a good plan too. Or maybe you start drinking the three Islay’s you picked up, or the three Ontario Single Malts, or even one of the 6 Scotch samples that are begging to be reviewed. What do I do instead? 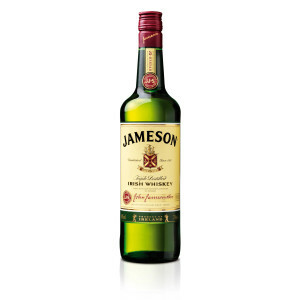 I go to Irish, and try out a general entry level Irish everyone has tried at some point, Jameson Irish Whiskey. Actually I notice that I have a sample dram that my parents recently passed along to me, as it was sitting around and no one was drinking it.